TETRION manufacture a range of specialist surface fillers for domestic and commercial applications. TETRION have been manufacturing decorator fillers for more than 40 years and have one of the largest ranges of domestic and commercial fillers in Europe. 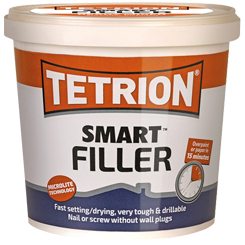 All purpose fillers - TETRION all purpose filler can be used both inside and outside the home to prepare many different materials including, wood, plasterboard, concrete and brickwork for painting. When dry, all purpose filler provides a durable hard surface which can be painted directly or covered with wallpaper to provide a professional, blemish-free finish. Ready mix fillers - TETRION ready mix fillers can be used to fill small holes when mixing up a full batch of filler would take too much time. Ready for instant use with little to no wastage, ready mix filler dries in just two hours to a hard durable surface which is free from blemishes and ready to paint. Interior fillers - TETRION interior fillers are formulated for use inside the home. Their quick-drying formula provides a tough permanent finish to all interior surfaces including woodwork, plasterboard and brickwork. Using interior filler in place of multi-purpose filler can save you time and money, because it dries quicker and costs less, while still providing the high-quality durable finish that professionals demand.